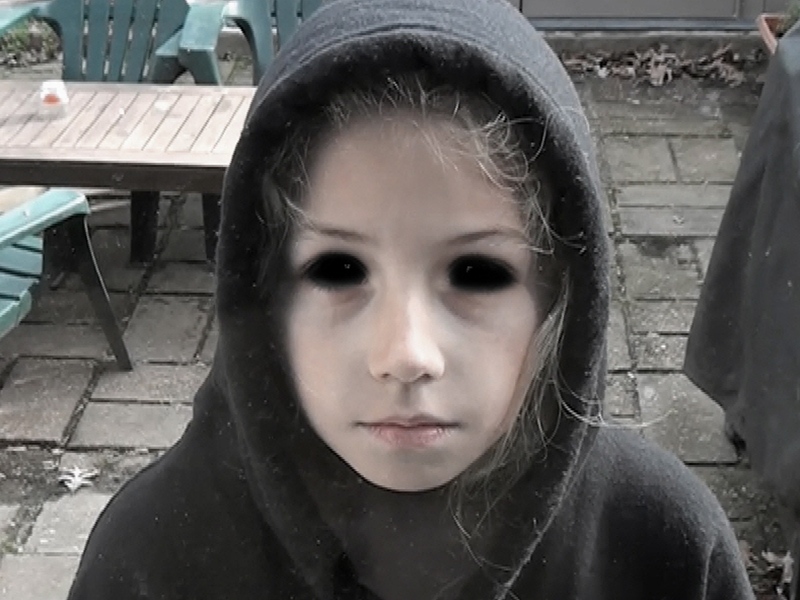 Black-Eyed Children: Let Me In is a creepily effective little “documentary” from director Justin Snyder. I put the term documentary in quotation marks because Black-Eyed Children actually isn’t a documentary at all. Instead, it’s a film that’s made up of footage that was supposedly shot by a student filmmaker (played by the film’s actual director, Justin Snyder) for a documentary about a real-life urban legend. For years, there have been stories about black-eyed children. They’re little children who you see on the side of the road or occasionally, they might even pop up on your front doorstep. Usually, they have porcelain white skin, which makes it all the more shocking to discover that their eyes are totally dark. Who or what the kids are usually depends on who is telling the story. However, one thing that you can be sure of is that it’s never a good thing to run into one of these black-eyed children. In Black-Eyed Children: Let Me In, the filmmaker played by Snyder interviews several people who had their own encounters with the Black-Eyed Children. Some of the people he talks to are funny. (I especially liked the guy who kept mentioning that he and his friends were all either drunk or stoned during their encounter.) Some of them are forever traumatized. We also get to see some footage of what happened when one of the kids showed up at a house. Finally, Snyder himself attempts to camp out near the river where the children have been seen and, in a nicely done scene, he gets a visit in the middle of the night. Black-Eyed Children is not the first found footage horror film that I’ve ever seen and I doubt it will be the last. But Snyder handles the format well and, as opposed to so many other found footage horror films, he at least comes up with a plausible reason as to why he would be filming all of this in the first place. The people that he interviews are all interesting and watchable characters. I assume that they were all locally recruited talent and, as a result, they give this film an authenticity that it might otherwise have lacked. They’re all good storytellers and interesting to listen to, which is good since so much of this film is made up of talking head interviews. Finally, Black-Eyed Children works largely because children themselves can be really creepy! We try to deny it because we want to believe that all children are cute and angelic but seriously, haunted kids are a hundred times scarier than haunted adults! Even without the black eyes, they’re scary! Black-Eyed Children does a good job of capturing that inherent creepiness.